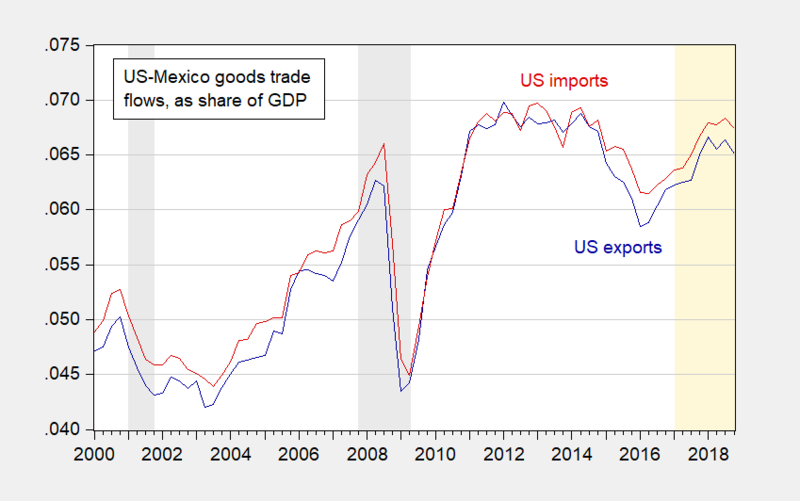 Figure 2: US goods exports to Mexico as a share of GDP (blue), US goods imports from Mexico (red). NBER defined recession dates shaded gray; Trump administration shaded orange. Source: BEA/Census and author’s calculations. A significant portion of merchandise trade between the United States and Mexico occurs in the context of production sharing as manufacturers in each country work together to create goods. Trade expansion has resulted in the creation of vertical supply relationships, especially along the U.S.-Mexico border. The flow of intermediate inputs produced in the United States and exported to Mexico and the return flow of finished products greatly increased the importance of the U.S.-Mexico border region as a production site. U.S. manufacturing industries, including automotive, electronics, appliances, and machinery, all rely on the assistance of Mexican manufacturers. This graphic (Bloomberg, 2017) illustrates the reliance on intermediate inputs in the North American production platform. Source: “One Tiny Widget’s Dizzying Journey Shows Just How Critical Nafta Has Become,” Bloomberg, February 2, 2017. This makes me pity the poor CEA staff economists that have been tasked to determine the macro impact of a border closure. My closest experience is trying to evaluate GDP loss in California arising from rolling blackouts, in 2001. I guess if I was tasked to evaluate the impact, I’d extrapolate to the 2011 Great Tohoku Earthquake which distrupted the East Asian supply chain, as well US auto production. On a more mundane note, we would run out of avocados in three weeks. I do actually like avocados. Got 6 of them the other day at 39cents a piece. Not too bad. I like to cut them into 1/4 pieces off of the seed and just eat them with my hands. It’s actually not too messy if you cut them at the right time. Feeling shared link remorse already. OT: speaking of a world of hurt. Moore. What a dirttbag. No wonder Trump loves him. …a judge found Mr. Moore in contempt of court in March 2013 for failing to pay more than $330,000 in spousal support, child support, attorney’s fees and a one-time fee to his ex-wife. Mr. Moore had failed to pay six consecutive months of child support — and only a small fraction of the nearly $19,000 a month he had agreed to pay his ex-wife in the divorce settlement — at the time of the ruling. He did not make these payments but he did declare deductions from his taxable income anyway. I’m sure the IRS will not mind. Why did his wife divorce him? I guess she was not happy that Moore had another girlfriend who tended to hang around in the same house the wife and three kids lived. Go figure! Of course Moore did pen a couple of op-eds lecturing liberals for not understanding why marriage was so important in terms of raising the kids. I am no longer drinking Ky bourbon/Tn whiskey. Soon Americans will be deprived of avocados. They may seem like trivial 1st world problems but none of this is good. Certainly not good for working Mexicans. NA supply integration works very well when not threatened with a wrecking ball. If investment in the USA slows as a result, the US economy is slowing and if the loss of confidence snowballs, the US will indeed land in a recession. Perhaps in order to inoculate the USA against further Trump-like manifestations, Trump should be encouraged to do his worst. Say whatever you like about the substance of Nigel Farage’s EU speeches, you have to give the man, he is entertaining. Apparently, the Wall Street Journal Editorial board is totally cool with a man who craps on his ex-wife and children. That makes for a “Class-A human being” in WSJ’s editorial view. That Rachel Maddow bit was awesome! Thanks for the link. Now I’ll have to find what Steve Benen wrote! Maddow’s blog site has never been the same since they took it off of “Vine”. It used to be one of the better blogs out there. When they took it off “Vine” and used it as a marketing tool for MSNBC they shot it straight to Hell. One of the many R.I.P. tombstones from what I view as the golden era of blogging. Anything that’s good they have to corporatize and take all the piss out of it. Less worried about avocados but don’t cut off my Modelo Beer! Just ask our two giant automobile manufacturers – Ford and GM. Something tells me that this shut down would be a disaster for Detroit. Paul Krugman has stated poor immigrants reduce wages for poor native-born Americans and threaten to unravel the welfare state. The poor immigrants at the border are willing to “play the system” to get into the U.S.. What’s to stop them from “playing the system” once they’re in? Not all poor immigrants want to get in the U.S. that way. They’re the ones, who deserve visas and we want in the U.S.. Unfortunately, there are way too many that got in illegally and unfairly already. So, we need to stop the huge inflow at the Mexican border, which has reached 100,000 apprehensions per month, by securing the border and providing limited quotas only for poor immigrants, who won’t attempt to get in illegally. And, the border control chief has stated with the poor immigrants trying to rush into the U.S., there are many drug dealers, gang members, and all types of criminals within the crowd. Moreover, I suspect, since many of those immigrants are very poor and just want a better life, they’re open to socialism or a redistribution of wealth and income from the relatively rich Americans. When did Krugman say those things? I missed it. Hyperventilating over “socialism” is not a sign of intelligence, especially when making unattributed statements about “many” drug dealers, etc. Willie, choosing to be ignorant isn’t a sign of intelligence. God you’re an idiot. What you quote PK saying there does not come close to the BS you early tried to attribute to him. You lie even more than Trump. No wonder he pays you for this intellectual garbage. Oh wait – PeakLiar never told us that little fact. Read the whole thing and not the intellectual cherry picking PeakLiar is known for! More lies. OK – you are late on the rent payments so you have to do this for your political masters. Then again Trump’s “border control chief” (who PeakIdiot cannot be bothered to name) is also a serial liar as well as a well known racist. Did he? Where is the link PeakLiar? Not that we don’t trust you but then again you have an amazing propensity to misrepresent everything else. Maybe Krugman wrote something on this topic but one thing we know for sure – you would not understand it. Put up the link or apologize to the rest of us for what I’m suggesting is another one of your patented lies. You finally put up a link. I read his oped. As usual you cherry picked so as to flat out LIE about what he was saying. Same old PeakDishonesty! Time to yell “racist” again. No lying piece of garbage. Krugman wrote a decent op-ed which you choose to misrepresent for your usual racist agenda. But hey – that is what pays your rent. Lying on behalf of the Trump agenda. I am curious what you would suggest the President should do. The pace of illegal immigration is increasing rapidly at the border: 48,000 in January, 66,000 in February, and around 100,000 in March. By mid-summer, another 500,000 could claim asylum in the US. Most of these will become undocumented residents. Half are minors, which will cost taxpayers $15,000 / capita / year in fiscal outlays. What do you think the President should do? Those immigrants are rushing in before Trump secures the border. Trump is making progress securing the border. After the border is secured, they all need to be deported for attempting to get in the wrong way. Then, we can regulate the number of visas for those, who haven’t attempted to enter illegally or unfairly. They are rushing in because the onmibus bill passed in February effectively dismantled border control for Central Americans traveling with children. The border is at present wide open and unprotected for those traveling with children and claiming asylum. Um, no. We forecast that up to 500,000 will be apprehended at the border in the next 3-4 months, with the vast majority accompanied by a minor and claiming asylum. The current system provides no means to achieve this. There are more than 1 million open deportation orders today; don’t seem to be a lot of undocumented migrants lining up to leave. Otherwise, removals (deportations) typically run 2-2.5% of the undocumented population. It’s not a huge risk for a migrant on any given day. That number is not much changed in years. A market-based system doesn’t look so bad now, does it? This would never have happened in a market-based system, and indeed, we could still pretty easily deport (actually, self-deport) the recent arrivals using a market-based approach. But otherwise, these folks are here to stay. They need to hit a wall. We know you hit your skull over the wall over and over every day – which explains your incredibly BOZO comments! Yeah, PT, how about that promised 35 foot wall constructed of modular concrete that Mexico is going to pay for? Maybe one erected at each port of entry where large numbers of immigrants seem to congregate. The ports where American goods are shipped to and from Mexico (goods worth in the neighborhood of a half trillion last year). That’s the same country that is Texas’s largest export market. Where lots of Texas oil goes and where lots of Texans still depend for their livelihoods on the awl bidness.. Where lots of small bidnesses account for lots of those exported goods. But, by all means, let’s shut down that border and build a wall to put Americans back to work. Except for the tens of thousands in Texas who will be looking for new markets to replace the $100 billion or so they lost when Mexico was sealed off for wall buildin’. That’s some powerful thinkin’, PT. We have no reason to think a wall would work. There are three approaches to resolving a black market: supply suppression, demand suppression, and legalize-and-tax. Demand suppression works. Peak, when you say we should kick Tyson Foods out of Alabama and into Mexico, I’ll know your serious. Legalize and tax works, and generally works well. Even as hard drug seizures over the unsecured border will be twice this year compared to the late Obama administration, marijuana seizures will be down 80%. 80%! That’s legalize and tax. We can do the same for migrant labor, but faster and cleaner. There’s a biblical story about walls that seems appropriate to think about when considering how great walls are. Just how long ago did Joshua live, anyway? I could have never imagined it but you got even more racist and stupid. You and PeakLiar are doing your best to support the racist agenda of Herr Trump! Pgl, what does it have to do with race? I know, you believe illegal immigrants and poor people are non-white, and need lots of help, from other people, because you’re a racist. EVERYTHING you babble about has to do with race. If you see even one Asian or brown person, you freak OUT! What he should not do is cut aid to the Northern Triangle countries. Evidence strong that at least in El Salvadoe the homiicide rate and the migration rates have been cut in half over the last two years as reportedlyi the aid has been used well. Take that away, expect an increase in migration from El Salvador at least. “But what steps should the President take? Illegal. These people cross the SW border of the US illegally. What is it the majority of posters here don’t understand about illegal? Law is the pillar on which a good economy resides. These immigrants bring crime, disease, and a dumbing down of the gene pool. There is only one reason for this rampant moral turpitude. The morally bankrupt Democratic party wants to win more elections this way, and use the political power gained to further erode the vitality of this country. Lurkers. Purportedly this is highly ranked economic website. Hence there are many of you out there. Why do not more of you weigh in on these issues? Immigrants bringing crime, disease, lowering the gene pool. If this was 1845, you could be talking Irish. The 1880’s, Eastern Europeans. Turn of the 20th century, Italians, et. al. And, of course, for nearly two centuries Asians in various ports of entry. No, I didn’t forget the current invaders from those three Mexican countries either. But speaking of lurking, where are those 283, 008 indictments you were sure (until you backtracked to maybe, sort of) were in the wings that would put liberal/socialist/communist and various /all around evil doers in their well deserved places? As I recall, this was news straight from Pakistan from a guy who knows more about evil goings on here than anybody. A pile of crap. Are you not aware that the crime rates of immigrants is lower than of native born. Please do not just repeat Trump/Fox News lies. I think this is a more complicated call, Barkley. Clearly, if you are in the country illegally, you have broken the law. And if you use fake ID or fail to pay taxes, you have broken the law. So virtually all undocumented immigrants are law breakers. Now, you mean violent crimes. For undocumented migrants, incarceration rates fall above the white community by 20%, but well below the black community. (See Table 1 at the link below.) For a suburban audience, is ‘only 20% higher crime rate than in your community’ a selling point? On the other hand, incarceration rates will include migrants arrested on immigration and related charges. So, for example, it seems to me that when an illegal is arrested, certainly in the border zone, the enforcement officers will routinely add a resisting arrest, assaulting an officer and minor drug charges. All of these are related to a border crossing violation, but can make an otherwise non-violent economic migrant look like a violent offender. Tricky. Finally, there is a good bit of crime against the migrants themselves. People are aware of this, but very few are prosecuted for such crimes. And the numbers are huge, if you have seen our migrant predation and victimization spreadsheet. But again, this is crime associated with a black market, and not with either an ethnic or income group. Fix the black market and that goes away. I can tell you this: With a market-based approach, we can create over a period of four years the most transparent, accountable and law-abiding system in the US, one that will have a materially lower crime rate than do whites. That’s entirely doable. Table 1 you link to does not seem to support your story. So, native whites have a crime rate of 891. All legal immigrants have one of 364, and, the important number, the all illegal immigrant crime rate is 706, lower than for native whites. There is an obvious reason why illegal immigrants have fairly low crime rares: they are afraid of being deported if arrested for anything. The issue is not whites versus legal immigrants. The issue is whether we need a wall. A wall is designed to keep out illegal, Hispanic immigrants, primarily. So if you see protests, it’s generally white people, presumably suburban, who are carrying signs saying keep out illegal Mexicans. Build a wall. So the proper comparison, in the minds of the predominantly white, conservative community, is between their own crime rate — white natives at 891 — versus illegal immigrant Hispanics, at 1097. That puts in the incarceration rate of illegal Hispanics at 23% higher than the for native whites. Now, if you move to legalize and tax, then by rights we should have very few illegal immigrants, and then, by a not quite apples-to-apples comparison, we would expect migrant Hispanics in a market-based system to have incarceration rates similar to those of other, legal Hispanic immigrants, that is, 507, which would be 43% below that of the native white community. The place to put the focus is on the adjective, illegal, rather than the noun, Mexican. Fix the adjective, and the noun will take care of itself. This is the uniform lesson of ending prohibitions and resulting black markets. If the crime rate by Hispanic illegals is really higher than white natives, why is it that the border cities of El Paso and Laredo and Brownsville and Nogales and so on have crime rates far below national averages? These are three discrete cities. We’re interested in aggregates. And again, we have definitional problems of what is a ‘crime’ and what is reported and who is caught. In my experience in New Jersey — as I have written several times before — I know Hispanics — I don’t know whether they are legal or not — to be hard-working, family-oriented, and committed to getting ahead and making a better life for themselves and their families. They embody, in many ways, the quintessential American spirit of the Pilgrims and the Pioneers, willing to risk life and fortune for a chance at a better life in the United States. So I have no problem with Hispanic migrants as such. But there needs to be a functioning framework that closes the border and ends the black market in migrant labor, and that has to accommodate the reality that 1) we’re not going to deport those who are here in great numbers, and 2) you can’t close the border with supply suppression. Having said that, I am frankly astounded that you, Barkley, and Menzie, and Slugs, for that matter, seem to have so little acquaintance with black market dynamics. You don’t seem to be able to recognize them and don’t seem to be able to diagnose them. No clue why. They are really a trivial case market distortions in economics. It’s just the rent control example from the front of the intro econ textbook, but with the constraint being volume rather than price. Why you are struggling to see that is beyond me. Steven Kopits: I am sorry, but I don’t recall having a made a comment on this or any other thread referring to your immigration proposal. That’s true, Menzie. Very true. Same with me, Steven. I have said nothing about your scheme of black market dynamics other than to say that it looks like a lot of the migration from the northern triangle countries looks to be driven by high levels of violence in those countries and to question some of your claimes about crime rates of various groups iin the US. I have said not a word about black market dynamics or your scheme, per se. I realize that you think that everybody here should be falling all over themselves to praise it, but I have nothing to say about it other than that some of your justifications for it seem to be either exaggerated or just plain wrong. I have happy to support any number I give you, Barkley. I am not asking you to praise the proposal, but to discuss it. Can we agree, at a minimum, that the standard remedy for a black market is legalize and tax? Iffen you wants messicans to stay in messico you need messican jobs. Iffen you wants less drugs from messico you need fewer murikan addicts. Iffen you wants fewer messicans in the drug trade you need good paying jobs in messico. Does shutting down the border do that??? Asking for a friend. messicans? I guess you wrote it this way so the dimwits in Trump World might actually understand your question! These are not Mexicans, but citizens of Honduras, Guatemala and El Salvador, primarily. It is not a matter of employment, but wages. The unskilled wage in Honduras is $1 / hour. In Hilton Head, it’s $16 / hour. Add to that the $4 / hour option on a US green card 15 years down the line (but excluding $15,000 of education and other taxpayer support for that minor you brought with you), and a Honduran can earn twenty times their Honduran wage in the US. This is not a matter of jobs, but pay differentials. If Americans could earn $1 million picking berries in Guadalajara, there would be no lack of takers going the other way, either. Ah yes – citizens of Honduras, Guatemala and El Salvador are BROWN people. Oh wait – Mexican are BROWN people too which is why Faux News claimed these three nations were provinces of Mexico. Hey Stephen – try mansplaining to us what the minimum wage is in Puerto Rico. They are BROWN people too! They pick berries for only $1 an hour? They must work 24/7 doing that since GDP per capita is $5500 per year not $2000 per year. Yes – agricultural is an important part of their economy but try bananas and coffee. Your knowledge with respect to their economy is on par with knowledge of everything else you so opine – you know nothing. Nothing at all! We are not speaking of averages, but of the wages of unskilled labor. Honduran doctors are not jumping the US border. The Honduran minimum wage 27 Lempira / hour, with 26 Lempira to the dollar. So about $1 / hour. They do have an income inequality issue but anyone who tells us that their workers are picking berries is not to be trusted on anything else. You are drawing statistics from a paper written about the economy in 1993? Seriously? We knew you were an idiot but DAMN! OK – you found a paper on the effects of raising the minimum wage. Good show but one problem. Not everyone is working for the minimum wage. Princeton Stephen – the source for all sorts of stuff that has NOTHING to do with his usual babble! Well, we stopped sending aid to those other 3 Mexican countries. That should help. Steven Kopits What do you think the President should do? Well, a good start would be to rethink our pulling aid to Central American countries. If anything we should be doing more to help clean up the mess down there. The Trump strategy is to put more fingers in the dike. The smarter strategy would be to take measures to reduce the upstream flow. And if I were Chinese President Xi then I would be looking at those Caribbean and Pacific harbors in Guatemala and thinking this might be an ideal time to start getting friendly with the Guatemalan government. Monroe Doctrine be damned. Trump’s an idiot. In other words, somewhat less than it would cost the economy to rear a native born minor. You’ll appreciate the irony of that statement coming from a MAGA wearing Trump supporter. Since when do illegal immigrants vote? You have to go back to the early 19th century to find a time when non-citizens were allowed to vote, and those voting non-citizens were entirely very wealthy and white Europeans who owned property in this country. If you’re really worried about the integrity of the elector process, then I suggest you get on board with the movement to abolish the Electoral College. What is it the majority of posters here don’t understand about illegal? Submitting a fake doctor’s report claiming bone spurs in order to avoid the draft is also illegal. Ignoring treaties that spell out political asylum procedures is also illegal. Violating court orders is also illegal. Taking improper tax deductions is also illegal. Lying on security forms is also illegal. Doing 66 mph in a 65 mph zone is also illegal. If you’re all that concerned about immigrants crossing the border illegally, then simply change the law to make it legal. Problem solved. The fact is that you don’t give a damn about the law; it’s just a convenient excuse to enforce your racist views. The issue in Menzie’s post was about the economics of Trump’s proposed plan to shut down the southern border. It’s idiotic economics. Care to dispute that? I agree, but I think it’s largely irrelevant. As I write above: It is not a matter of employment, but wages. The unskilled wage in Honduras is $1 / hour. In Hilton Head, it’s $16 / hour. Add to that the $4 / hour option on a US green card 15 years down the line (but excluding $15,000 of education and other taxpayer support for that minor you brought with you), and a Honduran can earn twenty times their Honduran wage in the US. This is not a matter of jobs, but pay differentials. If Americans could earn $1 million picking berries in Guadalajara, there would be no lack of takers going the other way, either. Steven Kopits In the case of Central American asylum seekers I suspect that it’s more a matter of trying to stay alive than it is the chance of higher wages in the US. If it were just a matter of income, then the sensible policy would be to hand out Yankee greenbacks to what they could have earned here. It would be a lot cheaper. But it wouldn’t solve the problem. They’d still be seeking asylum. You asked what Trump should do. Apparently we both agree that he should rethink his plans to pull monies earmarked for Central America. That might not solve the very immediate problem, but it would likely lessen tomorrow’s immediate problem. The US foreign policy under Ronald Reagan in the 1980s is what created MS-13 in El Salvador. When it comes to Central American politics and economic problems, our hands are not squeaky clean. I am not aware that there is famine or depopulation in Latin America. People are staying alive there. They are coming for a better life here. That’s a rational decision. If the border is materially open, they will come, and at an increasing pace. No one there fears for their lives or the lives of their children? Seriously? You have to be the most uninformed person in the history of all time! Please stop as you are making the entire world more stupid with your incessant babble. Maybe you know better, but a lot of these people say they are cominb because of fear of being killed. At least one person who was deported to El Salvadoe who made this claim when he arrived was killed after he was sent back there, but obviously he was just lying and only came here for higher wages, as you, great expert on black market dynamics definitely knows. Fewer than 1% leave because of violence or gangs. For me, this a bit like the crime rate debate. Latin Americans come to the US to better their lives, to increase their utility, as this is a econ website. A number of factors come into play, all of which can be quantified in dollar terms at some level. Security is part of it, but not all of it. If you work with the material, as I do, it’s pretty clear that economics is ordinarily the driving factor. But it’s not the only factor. As for asylum. : As I understand it, the overwhelming majority of those claiming asylum will be denied it. Fear of gang violence is not grounds for such a claim. So what’s doing to happen to all those here by claiming asylum? “If Americans could earn $1 million picking berries in Guadalajara”. Guadalajara is the capital of the Mexican state of Jalisco. It has a population of 1,564,514, and is the second largest metropolitan area in the country. It is first in terms of high tech manufacturing and design. Guadalajara is an epicenter for business and manufacturing in west Mexico. In 2007 FDI magazine referred to research demonstrating that Guadalajara was the top ranking major Mexican city. The report also highlighted that it has the second strongest economic potential of any major North American city, only Chicago scored higher. Guadalajara was deemed “the city of the future” due to its young population, low unemployment rate and large number of foreign investment deals; it was also found to be the third most business-friendly city in North America. 40 thousand is a small fraction of the population of Guadalajara – which BTW is still in Mexico not Honduras. Do you even have a clue what you are babbling about here? Didn’t think so. Fine – there is a berry farm somewhere in Latin America. There are berry farms in NY State too. And your point is ??? Oh yea – you are stupid. Gee Steven – we know that already! So even these berry workers are staying on the local farm as things are getting better. Thanks Stephen – you have shredded whatever stupid point you have been trying make. Learn to read something. OK? You are overstating the economics here. Reportedly lots of the recent migrants have been fleeing violence. That is why El Salvador shows what iis up.Training police and some other actions with the aid have brought down the homicide rate, and, well, the migration rates has gone down as well. This aid has beeen working it looks like, at least in El Salvador. Not so much yet in Guatemala or Honduras. Analysis by CIS shows that in fact recent migration rates and unrelated to crime rates, specifically murder rate, in the respective countries. Good grief. So all these people who say they have left Central America because of the dangerous conditions there are lying? The conditions are dangerous. Your little regression here does not change that reality. But nice try! Yikes – I feel dirty just clinking on that link! Princeton Stephen is a blatant liar who routinely cites some vile sources as if they are the leading authorities. His latest Trumpian agenda is to suggest people are not fleeing Central America because of violent conditions. His latest source is the Center for Immigration Studies. Who are they you ask? Read on as even the Cato Institute and the Heritage Foundation want to have nothing to do with their bogus “studies”. But Princeton Stephen finds their research as fitting his own racist and dishonest agenda. Go figure! The pace of apprehensions from El Salvador in FY 2019 is about twice that of FY 2018. Steven Kopits is SCARED to death that 0.5 million people might migrate here this summer. Where did he get this number? From the same source he gets all his numbers – he just made it up. I wonder if Steven Kopits even knows the total population of these three nations. Let’s make it easy for him – it is almost 10% of the US population aka 32 million people. Let’s say migrants reach 1 million or 3% of their entire population. Guess what? That would represent only 0.3% of the US population. Of course that many BROWN people here would overwhelm these racists. Ewwww – another BROWN person just got on the subway care. HELP! The half million number is a forecast. We do know, however, that approximately 20 million of those 32 million Northern Triangle citizens you mention live in poverty. Given an open border, the expectation that millions of these would move to the US seems reasonably plausible. Our number derives from the belief that migrants themselves think this gap in asylum law is likely to be fleeting. Therefore, those who can, will move as soon as they can. We’re at 100k per month now, increasing by 34,000 last month. There’s a path to 500k apprehensions for the Apr 1 – July 15 period. A forecast ala Princeton Stephen? LOL! So what is your forecast of the amount of snow NYC will get tomorrow? PLeaSE! I am not sure 500k migrants scare me as such. But they will scare a lot of Americans and will cost the Democrats the House. And they might just get Donald Trump re-elected. So sure, if Democrats want to be known as purveyors of chaos, lawlessness and impotence, here’s their chance. You have suggested that most Americans are even dumber than you are. There are a lot of dumb people but NO ONE matches your incredible stupidity. 2slugbaits, what’s more idiotic is allowing 10 to 20 million poor illegal aliens into the country over 20 or 30 years. That’s actually worse than 10 to 20 million illegal aliens all rushing in at once. Our dumb immigration policy created a humanitarian crisis. Many are being taken advantage of and killed. And, we need to be able to take care of our poor citizens. 10 million people rushing in at once. Even the village idiot Princeton Stephen puts this number at 0.5 million. You two scared racists should coordinate and get your lies in order! Of course Puerto Ricans are brown citizens so to Trump – they do not count. You’re flattering “Princeton”Kopits anyone in the White House gives him the time of day. It looks like Hogan Gidley is a Huckabee crony. Nothing more, nothing less. No talent guy, got his job by glad-handing, same as Moore. Last I checked, the average cost of public school is $10,000. More on the coast, obviously. Then many of these migrant children are eligible for various forms of food support, TANF and SNAP if I recall correctly. So they will be more expensive on average to educate. The flip side is, of course, that these migrants don’t generate a lot of tax revenue. So it’s essentially pure cost (more precisely, pure outlay). This is not the fault of migrants per se, but the direct result of our taxation and spending policies in the US. Last you checked? What are your sources? Oh yea – the dark web where right wing liars rule! Last you check! LMAO! “There are some federal programs that serve those in need, regardless of immigration status. Programs that serve undocumented immigrants include school meal programs, the Special Supplemental Nutrition Program for Women, Infants and Children (WIC), Head Start, and various in-kind emergency services. Undocumented immigrants are also eligible for Emergency Medicaid. This program typically covers acute medical situations including childbirth but not longer-term treatment for chronic conditions, even if they are life-threatening. The services provided vary by state. Emergency Medicaid is estimated to cost about $2 billion per year, well less than 1 percent of the overall Medicaid budget, and most of that cost is thought to be attributable to unauthorized immigrants. People need to read the entire discussion as well as the links to see how grossly you misrepresent these issues. I do declare – your misrepresentations Trump even those of PeakDishonesty. So about $12,500 in 2019 numbers. Wow investing in kids is expensive. Of course if you bothered to show what happened over people’s life times – it would undermine your racist agenda here. But of course you are either too lazy or too dishonest to cite the studies of life time net contributions. Princeton Stephen – the master of disinformation! Steven Kopits I wasn’t talking about what it costs federal, state and local governments. I said that it likely cost the economy less than to rear a native born minor. You’re thinking like a cost accountant and not an economist. these migrants don’t generate a lot of tax revenue. So it’s essentially pure cost (more precisely, pure outlay). Here again you’re thinking like a city administrator or cost accountant rather than an economist. Every dollar they receive also gets spent. That means it’s taxable income for some native born business owner. In general immigrant children consume fewer total economic resources than native born children. Total economic resources includes more than just schooling and SNAP benefits; it also includes video games, cars, drugs, soccer lessons, bribes to colleges, etc. Eventually migrant children become workers who contribute to GDP, just as native born children become workers who contribute to GDP. Taxes are just a percent of GDP that gets directed to public use. The objective isn’t to minimize taxes, it’s to maximize GDP and economic welfare over an infinite horizon. In order to do that you need more economic inputs, with labor being one of those inputs. And because policymakers should be looking out over an infinite horizon rather than just the next election cycle, it means they shouldn’t distinguish between who is currently a native versus non-native minor. That’s just a transient legal distinction that has no economic meaning. You tend to obsess over government tax and spending as though that’s the be all and end all of economics. It’s not. Public finance is important, but not for the reasons you seem to believe. I didn’t say migrants don’t add to GDP. In total, they enable 2.5-3x their own wages in GDP. But they are a net burden to taxpayers. You’re making the fully open borders case, Slugs. Don’t know that you will find a lot of Americans who support you. They do and they pay taxes. You said they do not. As usual – your babbling is flat out wrong. But don’t let me stop your parade of embarrassing yourself! Steven Kopits they enable 2.5-3x their own wages in GDP. But they are a net burden to taxpayers. You need to think that through. Also, when you took public finance (you did study it, right? ), did you learn the difference between a tax impact and a tax incidence? I ask because sometimes I wonder. As to fully open borders. Yes, I would support that as a general policy although I would agree to a few exceptions such as a long history of violence, certain kinds of communicable and terminal diseases, etc. I also support the free movement of capital across borders. I don’t think many people would complain if there was a sudden influx of lathes, drill presses, tractors, and MRI machines coming across the border, so I don’t understand why people should be any more alarmed over an influx of laborers. The real reason people fear immigration doesn’t have anything to do with economics. At the end of the day it’s all about tribalism and racism. It usually gets prettied up with polite terms about cultural identity and language or whatever, but at the end of the day it’s just ugly racism pure and simple. I did think it through. The Arizona data make that pretty clear. And I think an open borders policy like that puts you either into the very libertarian group or the very radical left group. Don’t think most Americans are with you, and for good cause. A welfare state and open borders are not compatible. You might be right about that. I always get worried when I find most Americans agreeing with me. It oftentimes means I’m wrong. Most Americans are economic nitwits. Open borders seem to have raised GDP in the EU. Closing those borders, as some backward EU countries are contemplating, will only make them poorer. As to open borders being compatible with a welfare state, I guess that depends on how you define a welfare state. If you define a welfare state as one that uses the government to protect entrenched and inefficient labor and industry, then you might have a point. Protectionist policies are not consistent with open borders. But if you define a welfare state as one that has a lot of income security programs, then I think open borders are not only consistent, but are a necessary condition for a robust welfare state. A welfare state depends upon high growth through the free movement of capital, the free movement of labor, and the free movement of technology & education. Accountants are generally stupid people but please do not insult them by suggesting they are anything like the babbling fool known as Princeton Steve. There are studies that look at immigrants contributions over their entire life times. These are often a significant net benefit to the rest of the nation. For Princeton Stephen to focus on what happens when a kid is in school proves two things. He is too stupid to think about the long-term and too lazy (or dishonest) to actually read these analyzes. But yea – this fool will babble on with more incoherent intellectual garbage. It is what he do! And then those well educated, well nourished children grow up to be productive Americans who pay taxes for 40 or 50 years, raise productive families, and add to the wealth, security, and productivity of the Untied States. Seems like a pretty decent investment to me. Just like investing in any other children who happen to be growing up here. Speaker Pelosi is on a roll! Pelosi didn’t stop at immigration. She criticized Trump and his administration for the decision to argue in a federal court case that the entire 2010 health care law should be dismantled, saying, “Them’s fighting words.” As to the health care plan Trump keeps saying Republicans are working on, Pelosi said mocked it as “his secret plan” since the president said they won’t pass it until after the 2020 election. Perhaps you should read the law. “Any alien who is physically present in the United States or who arrives in the United States (whether or not at a designated port of arrival and including an alien who is brought to the United States after having been interdicted in international or United States waters), irrespective of such alien’s status, may apply for asylum in accordance with this section or, where applicable, section 1225(b) of this title. Note that the law specifically says “whether or not at a designated port of arrival.” The law requires immigrants to be allowed to apply for asylum. It doesn’t matter how they arrive in the country. Now the fact of the matter is that most of these asylum seekers are attempting to enter the country legally at border ports, but Trump’s border patrol is not allowing them to enter and apply for asylum as they are legally entitled. So some do attempt crossing at other locations. But that is only because Trump is failing to comply with asylum law at border ports. And according to law, even those who cross at other locations are still entitled to due process for asylum. So please spare us your whining about illegality. It is Trump who is acting illegally. Can DHS secretary Kirstjen Nielsen be this incredibly stupid? We are wasting a lot of resources to “protect” us from brown babies but the DHS has reduced the cost of monitoring white terrorists so I guess in a budgetary sense, it is all good! Pardon me but this is a load of horse manure. If Trump was not wasting resources on his racist wall and busy separating kids from their parents, they would have plenty of resources to humanely address this immigration. Oh wait – I miss the entire point. This is not about border security or even humanely treating immigrants fleeing death. It is all about stirring up his racist base by abusing BROWN people wherever possible. And that can get expensive! That’s where the logic takes you. I have an op-ed pending on this. Cool! I’ll skip it like I skip the rest of your worthless blogging! Kopits has said this twice. What is his obsession with Hilton Head, a ritzy vacation resort for the rich? Does he think this is representative of unskilled labor in the U.S.? So, anyway, what about his claim of “$16 / hour”? We can go to glassdoor and see what people in Hilton Head are actually paid. Let’s see. Barista – $9/hour. Retail sales associate – $11 / hour. McDonalds – $8. Hotel desk clerk – $9 / hour. Tipped waiters – $2.13 / hour. Where are these $16 / hour unskilled workers you speak of? Yes, there’s a pretty big spread at $10-16 / hour. So call it $10 / hour. 10x Honduran wage, about 7x net of higher expenses. +$4 / hour green card option at 15 years. +$10,000 / year for the minor you brought with you. Lord – you cannot even support your own made up facts. Economics? Give us a break – you have no clue what the term even means. BABBLE ON! But this has more to do with high homicide rates and people fleeing extreme violence. Oh that was quite the rebuttal! NOT! You are right that the recent surge cannot be tied to homicide rates in the N. Triangle, but in fact large numbers of those requesting asylum base it on fear of being killed. Furthermore, the evidence out of El Salvador strongly supports the link: both homicide rates and migrations rates have fallen in half roughly in the past two years. That is a strong correlation. Your “no” is not credible. I put up two replies to Steven K. earlier that have not aappeared yet. I shall do both of them here. Sorry, Steven, but “no” is clearly wrong. The homicide rate in El Salvador has fallen by about half in the last two years, and so has the migration rate from there. Looks pretty strongly linked, even if last two months surge may not be. From an earlier point, you made apparently false claims that illegal immigrants have a higher crime rate than native born whites. Sorry, but no. Look at the Table 1 you cited from the link you provided. Crime rate of native born whites at 891 while crime rate of illegal immigrants at 706, with that of legal immigrants at 366. So much lying about all this, you should not be joining in on thiss. I address incarceration rates above. I personally loath this topic, for two reasons. First, incarceration rates are not the same as crime rates, and crime rates are not the same as things you think of as a crime. Is using a fake social security number a crime? If you’re a native white, the presumption is ‘yes’, because everyone should be able to get one. So you assume there has to be something more to the story, perhaps some kind of fraud or swindle. For migrants, I think most, or at least many (but not Peak) would say, ‘no’, because all the migrants are trying to do is work and pay taxes. It is a crime the result of their legal standing, not personal predisposition. Similarly, black markets are huge generators of crime. About 2/3 of Mexico’s and half US inner city crimes rates can be directly attributed to prohibitions and resulting black markets. Black markets always arise from government intervention. They are by definition artificial and policy-induced. So whom should I blame for the resulting crime? The various proximate participants, or the government? And of course, we’re the only ones trying to systemically catalog and measure the predation and victimization associated with the migrant journey. I don’t care that much, for an important reason. We know that black market pathology drops by 95% when a legalize-and-tax system is introduced. The key is to end the prohibition, rather than arguing about the relative merits of different kinds of people and focusing on enforcement. In a market-based system, we don’t need a wall, and Border Patrol headcount is reduced from 26,000 to 4,000, which is what it was in the early 1990s. So we can spend a lot of time arguing about incarceration rates, or we can fix the underlying problem and the whole issue goes away. I said ‘no’ because you cannot get the kind of fantastic acceleration in apprehension rates from any kind of link to crime rates. You can, however, derive it pretty easily from changes in the law. Look at the first graph at the link below. It just rockets up after the omnibus is passed. Conservative analysts and commentators explicitly warned that it would lead to such an outcome. Second, the diverging trends among single adults, minors traveling along and families is strongly suggestive of differentiated policy. Otherwise, apprehensions should have increased pro rata among these various groups. And they haven’t. Adults are up only modestly, but families, through the fiscal year to February, were up 338%. (And that’s before even higher March figures.) Shouldn’t get that pattern from violence. So, I answered ‘no’, because the answer is flatly ‘no’, as anyone who works regularly with these numbers is aware. If you want to get a sense of how these happens on the ground, I strongly suggest you watch Jay Root’s video, Border Hustle. Trump hates brown people but he loves it when they serve him. But something tells me that these ultrarich racists want darkies to make a lot less than $16 an hour! Princeton Steven probably thinks he was picking berries or whatever. No – he was rookie of the year last year playing from my Atlanta Braves! So now it sounds like big, tough guy Trump is walking back all those threats to close the southern border. The fig leaf BS story is that Mexico has suddenly taken big steps to stop the flow of Central American migrants going into Mexico. Sure. Right. That’s the official story and Team Trump is sticking with it. Never admit that Trump made a mistake and is looking for a way to back down. I wonder what Trump’s golf score was today. I’m guessing it was a good 15 under par…maybe better. The problem is that either the forecast numbers are right, or they’re wrong. If they’re wrong, well, maybe the problem goes away by itself. If they’re right, then Trump will be back in the frying pan soon enough, plus 100,000 new undocumented immigrants. The White House seems very thin on analytical capability. 100 thousand? I guess you have abandoned your 500 thousand “forecast”! LOL – so are you! Trump’s golf score? Have you bought this tell all book? And now we learn that Trump regularly cheats at golf. How surprising. It’s important to separate Trump for objective facts on the ground. Two different things. Objective facts on the ground? Seriously? You are holed up in Princeton, NJ and you think you have a clue what is happening in Central America. God – you are one pathetic fool! So you back off your claim of $16 for unskilled labor that you pulled out of your — hat? Why do you keep doing this? You keep making up numbers that are just off the wall to support an argument. Just like your Puerto Rico numbers. Why would anyone believe anything you say when you do this over and over. School districts need more money to teach students English, to improve their performance. I heard, Nevada had to come up with another $1 billion recently. Well schools do need more funding which means we need to raise taxes. Somehow I case the basics of government budgets are beyond your preK arithmetic skills given your endorsement of tax cuts for the rich! Ever wonder why PeakLiar never links to actual data or reliable stories? Try this stupid claim that Nevada has a budgetary shortfall near $1 billion. Here is one of many discussions of the fiscal situation in Nevada and once again PeakLiar has his head up his rear end! Oh wait – PeakLiar never learned English so he will not be able to read this link. Never mind! Given that Nevada’s population has tripled in the past 30 years, more education spending is not a bad idea. Unfortunately, the state’s per capita education spending is still below that of neighboring states (California, Arizona, Utah, Oregon) but should improve in the future with Nevada becoming more involved in tech and manufacturing. Nevada, politically, is becoming a darker shade of purple with the old Trump base shifting away from Clark and Washoe counties where about 85% of the population resides (about 72% in Clark County alone). An educated, competitive Nevada will be a positive thing. Good to know you’re on board with increased spending since Democrats control many state offices and both houses of the legislature . And both Senate seats and a majority of the congressional delegation. BTW, I’ve had relatives/in-laws living and working in Nevada for the past quarter century though I’m fairly sure my knowledge of the state pales in comparison with yours as you’ll no doubt assert. This is another one of my dumb questions, and I really don’t know the answer to this one this time. But wouldn’t closing the border with Mexico be just like a tariff that eliminated international trade with some country, so that you could take the tariff studies and do some sort of extrapolation? Probably not. I am guessing the ports and airports would stay open (you could fly from Mexico City to JFK). Possibly truck lanes and train crossings. I think an analysis would be hard to do. But it would be disruptive in the short run, for sure. It’s actually not a bad question (there are very few “bad” questions). The answer is “YES”, you could do extrapolation and learn some things–but in this case the extreme costs of anything you would/could learn from that are higher than the value of what you would learn (and this is coming from someone who is a strong proponent and believer in education and even experimentation just for the sake of learning). I think it is more like autarky than tariffs. Steven Kopits Sorry, but your claim that migrants from Central America are coming here to seek higher wages rather than political asylum and physical protection just doesn’t pass the smell test. If what you said were true, then wouldn’t it make more sense for each family to send north one or two of its strongest family members who could then earn your $16/hour here and then send a portion of those earnings back to Central America, where those remittances would have greater buying power? Why would any rational economic actor forego that option in favor of traveling with vulnerable mothers with young children? How stupid do you think these people are? Even MAGA hat wearing Trump voters aren’t that dumb. On the one hand you assume those migrants are smart enough to game the US immigration system, but on the other hand they’re stupid enough to ignore the least risky option with a higher expected gain. I’m afraid that you’re too emotionally attached to your pet theory. Are you sure you’re not just superimposing your own personal experience and motivation onto other migrants? Note how Princeton Stephen has resorted to citing the Center for Immigration Studies. See my comment above as to what a dirt bag group CIS really is. Princeton Stephen is a blatant liar. Full stop. Yes! It does make sense as does SK’s proposal, but then you let the angry liberal out to ruin a perfectly rational comment, and then sowed you own ignorance: “On the one hand you assume those migrants are smart enough to game the US immigration system, but on the other hand they’re stupid enough to ignore the least risky option with a higher expected gain. ” That’s what has been happening for years until immigration law changed. I’m afraid that you’re too emotionally attached to your pet theory. To recognize how wrong you are and have been about so many other dog whistle issues. If you want a list of these crazy issues, I and almost any MAGA hat wearing voter could provide could provide one. It may take another election loss to open your eyes and lower liberal’s anger. Unless you see you’re your and this country’s worst enemy things won’t change. Hey I’m all for things like a “market driven proposal” if the issue were migration for economic purposes. But are you so incredibly stupid that people fleeing violent societies are only interested in increasing their wage rate? I know Princeton Stephen is indeed that incredibly stupid. Look – he has wasted everyone’s time over and over again with this BS. So I guess you figured it is your turn to waste our time with an off point rant. It is what you do. So hey! BTW CoRev – since you fell hook, lie, and sinker for that Barr 4-page white wash of Trump’s corruption, you will need and hide once the real Mueller report comes out! CoRev I believe you completely misunderstood my comment. Steven Kopits was arguing that Central American migrants were coming to this country not to seek asylum from violence, but for economic reasons to earn a higher wage. I was simply pointing out that if that were true, then the rational strategy would be to send only young, working age adults. The worst strategy would be to send vulnerable women and children who could only add risk to the migration and could not add significant income even if admitted into the US. The fact is that significant numbers of women and children are showing up at the border, so either those people are utterly irrational or (more likely) sincere in their fear of violence. In that exchange I was not arguing one way or the other about Steven’s “market based” immigration program. I am simply pointing out that the Central American migrants are not behaving as rational economic actors if their concern was strictly economic. A more plausible reason explanation is that they really are fleeing violence. Please make an effort to at least understand the discussion. He attributes their motivation as principally economic. I think the evidence points to fear of violence. Now as to the merits of Steven’s market based immigration plan, I really have two overarching issues with it. First, there really isn’t a lot of market economics in it. Just because you set up a system with a price does not make it market based. His proposal is, at the very best, an incomplete market. And if you ever took any econ course at all, then you should know that incomplete markets can yield very bad outcomes. My second big issue is that he really hasn’t taken his idea to its proper logical conclusion. If you really believe in a market based immigration plan, then the government should not set any artificial limits on the number of immigrants coming into this country; i.e., there should be free movement of people across borders, much as in the EU. What Steven Kopits is really offering is a disguised way for politicians to accept higher immigrants in a way that would be palatable to the rabid, racist elements of the GOP. In that regard his plan is akin, at least in spirit, to the way some GND advocates have latched onto MMT as a kind of cover story for more government spending on green projects. In other words, if you agree with Steven Kopits’ market based immigration plan, then he has succeeded in pulling the wool over your eyes. The intent behind his plan is to dramatically increase the number of work visas (which businesses would like), without increasing the number of immigrants who would permanently settle here (which the MAGA hat racists like). My suggestion to Steven Kopits is that he go read Solon’s reasons for rejecting exactly that kind of approach back in early 6th century B.C. Athens. And why the ancient Roman Middle Republic eventually relearned that same lesson. 2slugs, what a sorry excuse for an explanation. His market approach is a take off on today’s H1B visa system, slightly more lenient with control enhancements. I really don’t think you know what his approach is. You need to go back and study supply and demand. I agree. That means it’s not a market based approach. It’s just a way to fix a price. If that’s your idea of a market, then you really have no idea what “supply and demand” means. You should comment less and just listen to your betters. 2slugs, please read his approach, instead of trying to interpret what the indistinct voices in your head are telling you it is. His is an open market using supply of jobs and foreign worker requiring to pay for job/county access visas demand. Only the closed minded or ignorant will NOT accept it as market driven. Keep commenting on something you fail to understand, please. It just shows which category in which you fit. It is nothing like the H-1B system. Here’s how an H-1B works when last I hired someone under its auspices. Is Walt Disney World an ‘incomplete market’? At its core, an MBV approach is a very simple system. You need to get a background check. If you pass that, you can work in the US on demand any time for any employer by paying the US government $20 / day (which varies with market conditions). Is that hard to understand? Steven Kopits: “Incomplete markets” is a technical term, referring to the condition wherein not state contingent prices exist in an Arrow-Debreu framework. FIne. What is the applicability here? If the question is, ‘Do we have to create securities for this given market?’, the answer is ‘yes’. So what’s being suggested? Don’t create documents legalizing the 8 million undocumented Hispanics in the country? That’s absurb. It elevates the status quo as some sort of paradise. Right now, we have no securities covering most of the market, right? That’s why it’s a called a black market. Yes, we’re going to have to go out and cover the country, and with a series of contracts beyond just the visa, eg, visa insurance, wage insurance, workplace harassment insurance, etc. Those are all commercial products which can be provided by the marketplace for a reasonable fee. Our job is to provide a template, a vehicle, for doing so, which for me a smartphone apps. This is not particularly hard, but the mindset within government is a big channel. That’s one reason why we’re so pressed for time. The intent is to close the border and end the black market in undocumented labor, at least for Hispanics. It is not to flood the country with migrants. I’ll have a paper out on this later today. Let me repeat this again, because I see you don’t quite understand what a black market is. Black markets arise when governments attempt to prevent buyers and sellers from consummating transactions. Right now, the entire remaining Venezuelan economy is essentially a black market. You cannot beat a black market with supply suppression. Give me one black market where the US succeeded? You can beat black markets with demand suppression (a la Arizona). The person who wants to kick Tyson Foods out of the US stand up and show yourselves now. The other option to handle a black market is legalize and tax. We’ve done that for alcohol, gambling and now marijuana. And all those are working out ok, although all of them are worse for you than hiring a Guatemalan to mow your lawn. Now, we are using a conservative, not liberal, objective function, in that the purpose of the program is not, not, to swamp the country with migrants (you’re sounding very Peak here, Slugs), but to end black market pathology. We can do that, but yes, it starts from the premise that trying to completely stamp out commerce will lead to far more pathology than finding a controlled channel for it. If you didn’t take that lesson away from Prohibition, maybe you should revisit the topic. We are not changing the number of workers which would have been here otherwise, with one exception. When you legalize a market, demand goes up by 10-15%. This was the experience of both alcohol by my numbers and marijuana to date. A 15% increase in Hispanic workers translates into 1 million persons. If we allow the price of the visa to climb to compensate, then the price of the visa goes up $0.30 / hour and the visas issued goes up 350,000. We’ll see a good bit more than that number of illegal immigrants come to the US in the next three months — without a visa program! So if you want perfection or nirvana, I am not selling that. If you want a good system which will work reasonably well for all participants, that I can give you. And it is two orders of magnitude better than the current system, with which you seem so enamored. First, I don’t think migrants are stupid at all. Uneducated and poor, yes. Stupid, no. This was in fact the historical pattern. About 3/4 of those coming across were men. Interestingly, the indirect data suggest that crossing the border has become more difficult, recently a 70% apprehension rate appears to be more likely, versus 55% prior to the Trump administration, and historically around 40%. This has professionalized the human smuggling business and now there is very strong border control at some parts of the border — by the cartels, from the south! Because the profit incentive has not gone away, indeed, improved with enhanced border enforcement and a strong US economy, migrants have looked to alternative channels to enter the US. Asylum has proved one way. In this case, you need the adult to travel with a minor, and that’s how the market has developed, most notably since last August, and then really extremely since the omnibus in February. Black markets are like games of whack-a-mole or an arms race, with each step by one side being countered by a step from the other. That’s why we have a veritable army of border patrol agents and yet even more migrants are coming in (and why a wall is unlikely to work). It’s often men with children. Sometimes full families with children. If you watch Border Hustle, this question of why she is staying in Honduras is posed to the mother at some point. As I recall, she pauses, and deflects the question. But if you look at our migrant predation and victimization spreadsheet, you know it’s because there’s a good chance she’ll be raped. That’s why they leave her at home, alone. Again, let me strongly suggest you watch the video, Border Hustle, that Jay Root produced for Time magazine. Classic Princeton Stephen. Duck, bob, and weave the real question but just ignoring the facts on the ground. No – look away at something altogether different and irrelevant to the issue being raised. You are a COMPLETE WASTE OF TIME! AND – notorious for citing garbage from outfits like the Center of Immigration Studies as if the crap they peddle is fact. Just pathetic! The studies on immigrant crime are poor. However, illegal immigrants cause more crime than legal immigrants. It should be noted, many Hispanics identify themselves as white and likely commit more violent crimes than whites. Also, I may add, although there are much fewer guns per capita in countries south of the U.S. border, there are more crimes per capita, including murder. Oh yea – spoken like someone who works for the Center for Immigration Studies. Or is your real name John Lott? So much bogus and racist statistics, so little time! It should be noted, criminal aliens are not in jail only for immigration violations. Similarly, drug offenders are not in jail only for drug violations (they were convicted on multiple crimes, plea bargained to lesser charges, etc.). “There were more than 730,000 criminal aliens in U.S. or state prisons and local jails during the period measured (2010 to 2015). They accounted for 4.9 million arrests for 7.5 million offenses. That is to say, one person often commits more than one criminal violation (e.g not only drug possession) or a more serious charge (e.g. drug trafficking). The article is somewhat sloppy. One main point is aliens in the U.S. may commit crimes at lower rates than U.S. citizens. If so, it’s because aliens from Asian and European countries have much lower crime rates. This is all about destroying GM and Ford based on what Trump said today. He wants tariffs on cars now and if that is not enough – he will close trade in components crossing the border. The SEC needs to investigate but I bet Wilbur Ross and Jared are short selling GM and Ford stock! So yesterday Trump declared that wind turbines cause cancer. And ordered his press secretaries to go out and repeat the lie. I am waiting for Rick Stryker to rush in and defend this just like he rushed in to defend Trump on the very first day of his administration when he lied about the crowds at his inauguration. The fact of the matter is as usual, it is all about Trump and his childish petty grievances – and personal business interests. Trump sued to prevent the construction of offshore wind turbines near his golf course in Scotland which he said would “spoil the view.” And just a few weeks ago Trump was ordered to pay legal fees in the court case he lost. That’s why this is suddenly popping up out of the blue. So that’s what this is all about. Trump being ordered to pay legal fees. Once again the president is running the White House as a subsidiary of his private business. It gets better. He says those needing an immigration attorney will hire Perry Mason. A fictional character from the 1950’s who defended people being tried for murder. Maybe Trump does not know this but everyone of his clients were eventually proven innocent! Not quite. He did lose a case. There’s an early episode in which he and Della are sitting around the office desk bemoaning the execution of one of his clients after Perry lost the case. That’s really all you know. He lost and the guy went to the gas chamber. It occurs at the very beginning of the episode and is only incidental to story’s main case…which Mason initially loses and then wins on appeal. Jared Bernstein is a great economist, but more importantly, a man of superb moral character and a man fighting to improve the lives of Americans who are struggling financially. Maybe God thought “Oh man!!! I can’t take two great guys like Alan Krueger and Jared Bernstein inside of one month’s time!!! I gotta fix this man’s brain hemorrhage!! !” OK, a little far-fetched to envision, but who knows?? Moses Herzog I agree that Jared Bernstein has a firm grasp of economics, but technically he’s not an economist. His academic background is in social work and sociology. Still, he knows econ better than way too many folks with formal academic credentials in econ. His CV suggests he’s something of a Renaissance kinda guy. Trump now wants to put Herman Cain on the FED? And we thought the Stephen Moore nomination was as low as one could go. Hey, it turns out Stephen Moore won’t be the lone wacko on the Fed. There are two seats on the Fed to fill and Trump just announced that Herman Cain will be nominated for the other one. Mr. 999! Let’s order some pizza! Cain is indeed a wacko and a gold bug too. Of course Moore is also a gold bug! Milton Friedman who advocated floating exchange rates has to be rolling in his grave! And, there will likely be no Cain Mutiney in the Senate. Who’ll hide the strawberries? When asked why it was called the “Tobit” model, instead of Tobin, James Tobin explained that this term was introduced by Arthur Goldberger, either as a portmanteau of “Tobin probit”, or as a reference to the novel The Caine Mutiny, a novel by Tobin’s friend Herman Wouk, in which Tobin makes a cameo as “Mr Tobit”. Tobin reports having actually asked Goldberger which it was, and the man refused to say. Cain is a serial adulterer. Was even making payments to one of them. That pretty much ended his presidential campaign. See, it’s disgusting and tawdry when black politicians cheat on their wives and manly and macho when white guys like donald trump and stephen moore do it. President Obama had a pristine clean marriage (there was only one very weak and unverified rumor that I ever heard while he was in office, and that unproven incident was from before his Presidency). Sometimes I think that’s what really bothers the white trash about President Obama—he has a cleaner record on his fidelity to his wife than nearly any white male who led our nation—and that really rankles the white trash and is a festering wound for the white trash Evangelicals and white trash Mormons etc because President Obama took their stereotypes and tropes about black males and shot it all to Hell. They’re never going to forgive President Obama for that one. I went out to check on some data and have been unable to find where you provided that link to the CIS study that supposedly showed no link between migration and homicide rates for the northern triaangle nations. While there was not a close year to year relation for Honduras and Guatemala, there was in fact a ver close link foor El Salvador, one of those cases where the headline was not supported by the actual figures. However, the data I went to look at tells the story, which has less to do with year to year variations and more to do with overall persistent levels. Honduras happens to have the highest muder rate of any nation in the worls. Guatemala is fifthe, and El Salvador is sixth. There is plenty reason for people to be fleeing those nations because of fear of being murdered, even if there is not a perfect correltion between year to year fluctuaions of those rates. The second highrest murder rate is in Venzuela, from which many people are also fleeing, with quite a few ending up in the US. In third and fourth place are two small nations, US Virgin Islands and Belize. Anyway, your claim that these high levels of migration have nothing to do with the murder rates in these nations is just stiking pile of crap, to use a technical term. You are outright lying. You have at times come off as more intelligent than some people here who agree with you, but on this matter you have just completely degenerated into deep lying. Well, first Anonymous, I do not know who you are. Why don’t you use your real name — as I do — and then call me a liar. Here is the CIS study. In general, I use my twitter account as a rolling bibliography. So if I have quoted a source, usually its somewhere on the twitter account. I left to check on some data and have not ffound where you provided that link to the CIS study that claims there is no relation between murder rates and migration in the northern triangle nations, so I am replying here. As it is, looking at that link, the relation in El Slavodor looks vr close, while the year to year variations on not so close in Hnoduras and Guatemala. Here is what this dumb study leaves out: Honduras has the highest murder rate in the world while,, following Venezuela, US Virgin Islands, and Belize, Guatemala and El Salvador have the fiffth and sixth highest such rares. It is completely reasonable for people in those nations to fear being murdered and wanting to leave because of that. Steven Kopits This thread seems to have wandered all over the place, so let me try and sum things up from my perspective. First, it may well be the case that with Mexicans the primary motive for wanting to immigrate to this country is economic; but extending that to the Central American immigrants seeking asylum is beyond ridiculous. Second, I’ve read your proposal a couple of times and you don’t have a lot of supporting econometric documentation. For example, you cite a demand elasticity of 0.15, but there is nothing that explains how you arrived at that number. My strong suspicion is that your 0.15 number is a result of simultaneous equations bias and is not a true elasticity. And some of your findings look like spurious regressions. Third, as I’ve mentioned before, just because you are setting a price doesn’t mean it’s a market in any meaningful sense of the term. As best I can tell the supply curve of your visas is exogenously determined, so the price simply reflects shifts in demand. That’s a good way to capture rent (or in this case a tax), but you can’t interpret the equilibrium as an economically optimal result. In real markets the supply curve is also a function of price. The price isn’t just a demand signal, it’s supposed to be a signal to increase the supply…in this case the supply of visas. But that’s not what happens in your scheme. The number of visas available is fixed. All you get is a princes and peddlers trading arrangement. And as I mentioned before, your “market” seems woefully incomplete. Finally, you never really told us why there should be any price. If you’re really concerned about maximizing economic welfare, then why impose an unnecessary tax on immigration? If you’re interested in an economic or a purely market based solution, then just let the market operate with as few constraints as possible. There is no economically valid reason for setting a price on a visa, except perhaps to cover the nominal administrative costs similar to paying for a passport. So clearly your “market based” approach has an ulterior motive beyond simple economics. I suspect that what you’re really after is finding a way to keep immigration at something like current levels, but to do so in a way that would give these immigrants legal protections they don’t already have. And that’s fine. If that were the end of the story, then I would say your proposal wasn’t ideal (open borders would be economically ideal), but it would be better than the status quo. Unfortunately, that’s not the end of the story. What you’ve overlooked is that once you reach the limit of visas offered at some price, you still haven’t done anything to address the marginal immigrant wanting to come over Trump’s big, beautiful wall. That potential immigrant still faces the same problem of being locked out, which means you’ve just recreated the same problem but with a different cast of characters. For example, suppose you set the number of visas at 1,000,000. Those first million come in without any problem. But the 1,000,001th person is still locked out and will want to cross the border illegally. Now obviously, the tighter the number of visas (e.g., 100,000 rather than 1,000,000), the worse this problem becomes and the less effective your solution is. Your solution works best when the number of visas is large enough that it isn’t binding enough to motivate people to come here illegally. But in that case, why not dispense with the whole charade and allow open borders? In other words, your scheme works best when it doesn’t constrain immigrants and works worst when it does constrain immigrants. That’s not to say it might not be somewhat better than the current system, but before we conclude that you need to rethink the long run consequences of having a large number of guest visa workers who have no path to citizenship. As I suggested before, go read what Solon had to say about that back in the 6th century BC. Or modern day Germany with Turkish workers or what’s going on in Israel. Do you really want to go there? Some points here. More later. A price-limited system implies that there are theoretically an unlimited number of visas for sale at any given time, much as there is theoretically unlimited gasoline for sale in a given locality. In truth, the volume of gasoline is finite at any given moment, but never runs out because supply and demand are mediated by price, such that there is always enough gasoline to meet demand, but not that much more. A market price-based visa system is analogous. The supply of visas is not regulated by doling them out one-by-one on an administrative basis, but by managing the price to ensure that supply and demand are in balance. Without a flexible price, the market might become constricted by a lack a visas, prompting a return of the black market; or conditions may be too lax through the issuance of too many visas, which would flood the market with new migrants. In a market-based system, at the end of the day, the US government does not take a position on the value of the right to work in the US. It does set the volume of visas to close the border and end the black market in migrant labor, but the associated price is set by the migrants themselves. Steven Kopits My reading of your paper was that people who currently held visas could offer them up in a kind of auction market, but the total supply of visas in the system was exogenously determined by the government. In other words, your “market” is one in which asset prices can change with demand, but no new assets enter the system. That’s what I meant when I referred to a kind of “princes and peddlers” kind of market, although that reference may have been a bit too obscure. As such, there is no objective price mechanism for determining whether the government has issued too many or too few. There is no real value added in having a market for visas unless that market can be tied to the requirements of the labor market. That means there has to be a supply response by the government, not just the holders of existing visas. Isn’t that what you meant by: ” It [the US govt] does set the volume of visas to close the border and end the black market in migrant labor, but the associated price is set by the migrants themselves.”? That’s the kind of market that adds to wealth without adding to national income. It’s also one in which sheer luck plays an inordinate role. Well, the supply of visas is always determined by the authorizing body, which ultimately answers to the US government. The offering up of visas is not essential to the model. It was intended to encourage those migrants not working to leave. But you could credit or roll over unused visa days. It’s not essential to the program either way. The objective function of the program is to 1) close the southwest border and 2) end the black market in undocumented immigrant labor. It has nothing to do with matching supply and demand per se, beyond achieving those first two goals. The metric for success is therefore the number of persons apprehended on the southwest border (a reduction from 2000 now to about 150 / day), on the one hand, and some as yet undefined measure of the extent of the black market in the US. The visa price and volume will be set to meet these two objectives. Now, there are other considerations. The first is the general economic well-being of the migrant community. The program is intended first and foremost to create a well-ordered market: transparent, convenient, fair, accountable and safe, among others. It is not intended to put the migrant community into penury, so that has to always be a consideration, and I wouldn’t be surprised if the Democrats somehow enshrined that into the mission statement. Second, it should be helpful to US businesses, but if the the border is closed and there is no black market, then from the conservative perspective, that’s the situation and businesses will have to adjust their wages accordingly (up). That labor market is no different, than. say, the one for trucking industry today, where there is a shortage of about 100,000 drivers. This is not a cheap labor program in its intent. So we are speaking of a conservative, not a liberal, program, or more precisely a conservative objective function sitting astride a liberal market mechanism. This may gain conservative support in the sense that we are closing the border, ending the black market, and holding migrant numbers no higher than they would have been otherwise. Fiscal conservatives also get a much better deal. This is also better for egalitarians and Hispanics, because 8 million undocumented residents get legal status and Central American migrants can come and go as they please. It would vastly improve the entire standing of the Hispanic community in the US and end the predation and victimization I have detailed elsewhere. If I were Nancy Pelosi, I would try to condition my support on establishing a ladder out of the program which allows long-term undocumented residents to graduate to green cards. For example, anyone who had been in the US since 2007 or before could graduate out of the program after, say, seven years of participation. I am agnostic on this, but there is nothing to preclude that in program design as such. You may feel a more open system is warranted, and that’s nice, but I need something that can pass in Congress with bipartisan support. I would add that this program as conceived would increase commercial air traffic in and out of the Northern Triangle countries by 30-40%, worth $1.5 bn annually in total, including Mexico. This can only help the development of these countries, and we have not even touched on the other conditions which will improve life there. Markets can be demand-constrained or supply-constrained. An ordinary market is demand-constrained. The central issue is always finding an incremental customer willing and capable of buying your product. Ford can always make more cars. The key is finding people to buy them. In a supply-constrained market, the issue is obtaining supply to feed unmet demand. All black markets are supply-constrained markets. If you can get the goods to market, there will always be customers willing to buy at a very profitable price. In Venezuela, if you can find a way to bring in a suitcase of toilet paper, you can easily sell it at a high price. Socialist (communist) economics are inherently supply-constrained. Migrant labor is a supply-constrained market in the US (at least normally, not necessarily in the 2008-2018 period). Therefore, if you can make it over the border, you can easily find good-paying work. In a market-based approach, we are looking to convert a supply-constrained black market into a demand-constrained ordinary market. We can do this several ways, as I describe above. A typical way is to put a fixed tax on a good or service like alcohol or marijuana. In such a case, demand will expand (assuming the tax is not too high) until the economic cost of goods + tax = market price. That’s one way to do it, and indeed, the typical way to do it. In the case of migrant labor, however, that would mean that the migrant population would expand until 1) wages fall to the Relocation Wage + visa fee, or 2) utilization falls to the wages to be earned equal the Relocation Wage + visa fee, or some combination thereof. The Relocation Wage, as I have said, for Mexicans is about $6.50 / hour, and perhaps $5 / hour for Northern Triangle migrants. I think as someone who thinks a $15 min wage is a good idea in NYC, I can’t imagine you would want the unfettered access of migrants to the US labor market. Conservatives would not have it that’s for sure. An alternative is to acknowledge that 1) undocumented residents are unlikely to be deported in great numbers (which is historically the case and consistent with public opinion polls) and 2) economic migrants cannot be deterred with supply suppression, eg, the Wall. If you believe that — and I do — then that constitutes the lower limit of the migrant headcount which can be reasonably achieved. Now, we can achieve that level with the current enforcement program, which is both farcical and cruel. Or we can just monetize the associated values and let people pay for the right to work here at its market value. In this case, the limit on the number of migrants is the price/volume combinations were are targetting, that is, approximately 6 million visas for undocumented Hispanic workers and another 250-450k / year for new arrivals. The enforcement in this world is at the level of the employer — just as it is for you today. You could work in California if you wanted. Why don’t you go? Because you need a job there to make it worth your while. If you can come to the US on demand — as we propose — then there is no need to sneak across and no need for urgency. If you don’t go today, you can always go tomorrow. Rather, just as for regular Americans, the limiting factor will be the ability to get paying work, ie, it’s a demand-constrained world. That’s how we regulate the market. I keep picking on Tyson Foods (because they were fined for employing undocumented labor and I know what conditions are like in poultry processing plant), but in truth, those guys are not going to hire illegals if the can hire 300 guys at a known price on demand at any time. The plant manager and the HR manager have absolutely no upside in breaking the law. (By the way, if you ever want to see a pissed off guy, talk the the CFO of an SOE.) Consequently, if there are enough visas to cover the market, then there will be few jobs available to the undocumented. Moreover, even now, Border Patrol claims to be arresting 90% of the people coming across the border. This could be true (although people try more than once, so a 90% arrest rates translates into a 60% success rate in illegally coming across the border with three tries). In a market-based system, if you are caught coming across the border, you will be disqualified from the MBV system. So if you’re coming in illegally, you will never have a chance to come in legally, which you could have easily done. With a 90%+ apprehension rate, those are really bad odds. Consequently, I believe it will be possible to make conditions tighter, rather than looser. The risk — and this is a real risk — is that we are able to sufficiently constrain supply that the price of the visa really goes up. Put another way, the implied cost of jumping the border may be so high, that not a lot are willing to do it. Moreover, the software likely to manage the system will be a variant on airline seat capacity software, and that is going to give you a monopoly price in revenue maximization. Paradoxically, moving to a market-based system may prove much more capable at enforcement than an enforcement based system as we have today. Notwithstanding, this program will only endure to the extent it is perceived as fair and humane. Consequently, the pressure to expand visas is likely to be more political than as a result of border jumping. And I think we need to be very sensitive to that. The Bracero Program — and the MBV is in some ways just a more balanced, commercial and high tech version of the Bracero Program — was killed for two reasons: 1) because it was perceived to lower domestic wages (as visas set below the market price would) and 2) it was perceived exploitative because migrants were tied to their employers in near feudal servitude. A price-based approach fixes both these problems, as a market-based visa price will arbitrage the difference between the Relocation Wage and the prevailing unskilled US wage; and because MBV’s permit unfettered on-demand access of migrants to the US labor market. They have full control over when they come and go, just as you do when you visit Disney World. But you still have to pay for a day pass. So sure, if you’re a marginal migrant, you can still jump the Wall. However, you’ll be caught and disqualified from participating in the legal program. And without a visa, you’re going to struggle to find a good job. And you can never leave and see your family. And the other migrants who pay $7,000 working beside you will rat you out to ICE. Will some people do that anyway? Yes. A lot? Probably not. Ford can always make more cars. There’s a reason why competitive market supply curves are upward sloping. Ford cannot “always make more cars” at the same cost. I can’t imagine you would want the unfettered access of migrants to the US labor market. Conservatives would not have it that’s for sure. Conservatives are stupid. And they’re a dying demographic. The risk — and this is a real risk — is that we are able to sufficiently constrain supply that the price of the visa really goes up. Put another way, the implied cost of jumping the border may be so high, that not a lot are willing to do it. I don’t understand what you’re trying to say here. Why would we want the price of the visa to go up? A higher visa price acts as an incentive for people to jump the border and take their chances. Moreover, the software likely to manage the system will be a variant on airline seat capacity software, and that is going to give you a monopoly price in revenue maximization. Not following you. Why is that a good thing? The object should be to increase GDP over an infinite horizon, not maximize government revenue. The objective is not to maximize GDP. The objective is to bring safety, order, transparency, dignity and security to a black market. It should foster prosperity, yes, but that’s not the purpose. This is my final comment on this now too-long thread, Steven. You have argued with some reason that the recent surge if iasylum seekers from the noerhern triangle nations to the US cannot be explained by a surge of homicides in those nations, although the decline over the last two years from El Salvador does track a decline in homicides there. Fine. But your alternative also does not explain it either. Has there been either a aurge of wages here or a massive collapse of wages down there that explain it? This is your theory, but it does not do it. Oh, and on black market dynamics, your proposal would reduce it, but not eliminate it. That is because as near as I can tell you would put limits on the numbers that could come at any time. That would leave open room for the black market to continue, if at a smaller level. Which leaves the question: just how much do you know about black market dynamics, Steven? There’s always a wage differential, Barkely. $1 / hour in Honduras, $10 / hour in the US (thank you, Joseph). If the border is open, it makes sense to arbitrage it. That’s not a deep insight. Certainly not to Latin Americans. Yes, there are limits as to how many come in, just as there are in Walt Disney World. But it’s mediated by price, not volume. No, the black market does not continue because it is literally the metric driving the issuance of visas. We literally issue the number of visas to close the southwest border. If we have to issue more, we do. That simple. I’m guessing we’ll tend to pay some vendors in cash. When I cut lawns in the 1970s, I was paid in cash. Not all of the economy is documented. I have said that legalize and tax will reduce black market pathology by 95%, not 100%. But compared to the situation today, that’s nirvana. As for my black market expertise: I am astounded that the economics community is so passive, that you seem to struggle so mightily to recognize a black market. True, during my time in Hungary, I spent much of it consulting in a black market environment. So I know all about black markets from experience. But still: black markets are a trivial case distortion in economics. You don’t recognize the markets for cocaine, heroin or prostitution as black markets? You must be amazed that marijuana smuggling over the open border has fallen by 80% since Trump took office, and is down 95% from its 2009 high. You must think the Mexico’s sky-high murder rate is because they are a violent people, rather than due principally to the country’s war on drugs and migrants conducted at the behest of the US government. You must think that Mexico is responsible for our problems, rather than our own demand for migrant labor and drugs. 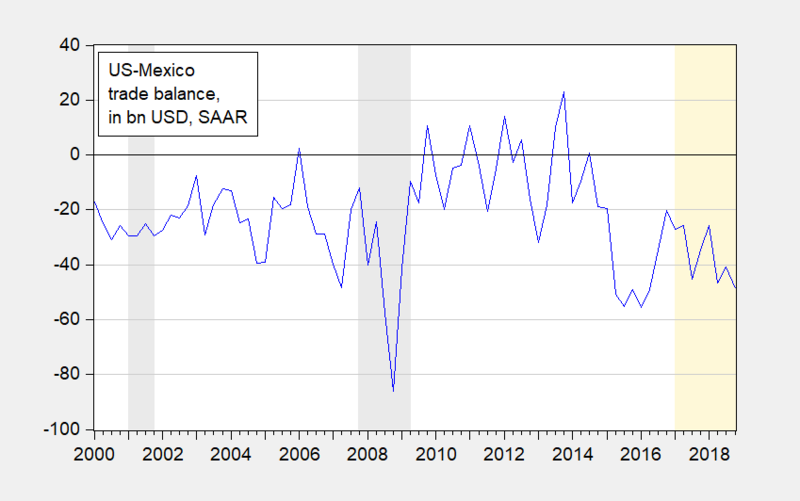 In its fundaments, here’s the deal: A Mexican can earn $2.50 / hour in Mexico and, let’s say, $7.50 / hour (net of increased living expenses) in Texas. Someone is going to claim the arbitrage. It could be the worker, but if the market is open, then another Mexican would work for less. So it doesn’t ordinarily go to the worker — at least not without border enforcement. It can go to the employer, which raises the specter of migrant exploitation or the depressing of local wages for US citizens. It can go to the Mexican headhunter (a huge source of corruption one can guess without looking) or as a deadweight loss, ie, in under-utilization. Notwithstanding, the differential between the Relocation Wage and the prevailing market wage is the rightful property of the people of the United States, that is, the government. It’s that simple. Within that reality, we have some scope to pick price/volume pairs. We can have a low price and a large increase in migrants. That won’t fly politically. We might be able to have a pretty high price and squeeze out some single Hispanics mothers and their children. I don’t think that’s going to fly either. Alternatively, we can pick a point around a neutral level and then tweak the market from there. I think that can work, and it is so much better than the disaster that currently passing for migrant policy. So, right now, I seem to be the only guy with black market expertise, at least with respect to migrant labor. Oh gag, Steven, your comment is so stupid, I have to reply. What makes you think I do not know about black markets. I know plenty about them. Indeed, I have publications with over 100 citations on them. You do not know whom you are making silly statements to. So, for your Disney World example, nobody is that desperate to get in that they are hiring smugglers to get them over its boundary and give them forged tickets so they can go on the rides. Really dumb attempted counterexample. You sort of say, they will issue more visas, but it is my understanding, correct me if I am wrong, but that just as at Disney World there is a limit per day, with your system there will still be a limit. So, some will still be willing to pay smuggler to get them across. Or is it only drug markets that you think are the relevant black markets. Regarding the matter of the recent surge, you confirm my point. There has been no major change in relative wages in the last few months to explain the surge, just as there has been not sufficient change in relative homicide rates to explain it either. But note that you made a big fuss about the latter point, while ignoring that the same argument applied to your big theory. You have just fallen on your face and made a big fool of yourself, or more bluntly, a hypocrite. There are ongoing differences in wages and ongoing differences in homicide rates. But, compared to other nations, the comparative differences in homicide rates are much greater than those of wages. That is why we see so many more coming from those nations than from all those others with much lower wages. Deal with it. Could you link me please to your publication on black markets that you think is most important and relevant to this discussion? It is a price-limited system. Like your gas station. Or Southwest Airlines. Or Walt Disney. Yes. It is plausible to assume that smuggling will continue if there are not enough visas to cover the incumbent undocumented community. After that, you have material coverage of the resident undocumented Hispanic community and pretty solid control over the border. The border will be closed, because we will continue to issue visas until it does. And the black market will disappear because we will continue issue visas until it does. After that, you’ll have pretty good control over the market. But if the price goes too high, then businesses and Hispanics will complain and you issue more visas. If it goes too low, conservatives will complain and you cut the visa number. This is entirely analogous to the function of the FOMC. I don’t think there’s any need to become too hyper about the whole thing. Consider: Did Repeal end the societal problems of alcohol, or marijuana or gambling? No, they are all serious problems, far worse than having a Guatemalan mow your lawn. And yet as political issues, they disappeared. So will the migrant issue, as long as it is operated in an orderly, safe, transparent, accountable, fair and properly compensated (from the US perspective) way. Are you conceding that migrant labor is a black market? Absolutely correct. There has been a huge change in the immigration enforcement regime. For citizens of the Northern Triangle traveling with children, the border is materially open. That’s why their coming up! But they are coming in search of a better life, which means higher wages and whatever price you’d care to put on the differential in personal safety. The point of this comment is what? Why do you feel you cannot discuss this topic dispassionately? Doing so implies making it to the northern Mexico border somehow. For Northern Triangle citizens, they can literally walk. For other low income jurisdictions, say, Sudan, first you have to find a way to fly to Mexico City and then walk north to the border. For people earning $1 / hour, that’s obviously something of a challenge, so the situation will naturally favor the citizens of the Northern Triangle countries. I think it is plausible, however, that the longer the border remains open, the greater share of those apprehended from countries other than the Northern Triangle. So, after all this, what’s your plan to deal with illegal immigration, Barkley? I don’t think it is a problem, so I do not have one. You think the current system is good? Eek! There may be limits, but the evidence is overwhelming that having more immigrants in your city, even illegal ones, tends to help your economy and lower your crime rate. Sorry, the only crisis here is the one hysterically cooked up by Trump and all his racist followers. BTW, your scheme may not be bad, but it does not do nearly as much as you claim, and your arguments regarding the underpinnings and justifications have been deeply flawed both conceptually and empirically. Kopits whole conversation is stupid because he is mixing up economic immigration and refugee asylum. The entire hysteria that Trump has whipped up about caravans is about refugees, which is an entirely different issue than his sale of visas to guest workers. Women and children don’t walk hundreds of miles with their children to become guest workers. And by the way, those caravans of families are not illegal. They are perfectly legal under immigration law. The law requires them to be admitted for evaluation for asylum. They aren’t illegal at all and it is Trump who is violating the law. joseph: Don’t bother Mr. Kopits with details. My goodness, Menzie, I must have just filed 50 comments with details. And I’m Steven to you. Or Stephen, for those who can’t spell. In this case, I don’t think they are separable. That’s not always the case. The Syrians, for example, are traditional war refugees, as were my parents and grandparents after WWII. Refugees will go home given the chance. The Northern Triangle guys are not looking to go home. No, they walk hundreds and hundreds of miles to become undocumented residents. However, right now, a child is the ticket in, so they’re bringing along the kids. In ordinary times, women represent 27% of those apprehended by Border Patrol, by the way. And they are routinely raped in transit. It’s not just walking. That may not be a problem for Barkley, but it is for me. A caravan is not a legal entity. The persons in the caravan may or may not be legal, depending on how they entered a given country. Asking for asylum is not illegal; however, the Trump administration is not admitting such people to the country and instead they are being held in Mexico under less than ideal conditions. As a result, migrants are entering the US illegally with their children and then claiming asylum. Illegal entry is illegal, but those claiming asylum can’t be deported or held for a long period if they have children. Consequently, those folks right now are being processed and put on the street in short order. That’s the essence of the crisis. What’s the crisis? It is a complete fabrication of racist Trump and his white nationalist puppet master, Miller. Families are seeking asylum. Trump is illegally refusing them at the border. So some of them enter illegally. That’s on Trump. Even those not entering at a border checkpoint are still entitled to a hearing on asylum. It is Trump who is causing the “crisis” by failing to process asylum claims properly. He could do this for a fraction of the $5 billion he wants to spend on a wall. Under Obama, asylum seekers were released into the U.S. 95% showed up for their asylum hearing because they understood that their asylum claim depended on their being at the hearings. Oh, and by the way. Trump has officially stated that the intention of his family separation policy is to “deter migration parents.” He is stating that he is intentionally caging children, traumatizing parents, and effectively creating orphans by losing their papers, in a deliberate attempt to frighten and terrorize migrants. That is a clear crime against humanity under international law. And for folks like Nielson who say they were “just following orders”, there was a famous trial a while back debunking that defense. You may have heard of it. Some were even executed for it by hanging. There are two discrete crises. The first was Trump’s with respect to the shutdown. I think most professionals in the business would have attested to a deteriorating environment, but not a crisis. The second crisis resulted from the change in asylum law with the February omnibus which effectively allowed Central Americans with children a free pass into the country. Since then, apprehensions have really taken off, and I would describe the current situation as a true crisis. In terms of numbers: Customs and Border Patrol today reported March apprehensions at the US southwest border at 92,607. This represents an increase of 25,723 (+38%) over February and 55,217 (+148%) over March last year. It is 7.6x the level of March 2017 and the highest level since 2007. I expect a material deterioration in the next two months. Kopits, in 2015 Germany accepted 890,000 refugee asylum seekers. And Germany is doing fine. For a population the size of the U.S. that would be 3.5 million refugees in one year. Talk to me when the U.S. has three or four million refugees in a year. In the mean time, your and Trump’s talk about a “crisis” is just stupid and racist fearmongering for sick political purposes. In 2015 and 2016, millions of refugees from Africa, the Middle East, and Central Asia poured into Europe, stoking xenophobic fears in many countries, and even provoking some countries to try to close their borders.1 Meanwhile Germany—an economic powerhouse with a falling birth rate and a historic image to shed—threw open its doors to Syrians fleeing a brutal civil war that had left them unable to go to school, work, or lead any kind of normal life. Chancellor Angela Merkel removed a legal EU barrier requiring Syrian refugees to claim asylum in their first country of arrival,2 famously intoning, “We can do this!” in a message to her citizens.3 Since then, despite multiple changes to EU law, more than 1.4 million people have applied for asylum in Germany.4 The majority are Syrian. Within a matter of years, Syrians have become the third-largest group of foreigners living in Germany (Turks are the largest, and Poles the second). Today, more than 700,000 Syrians are dispersed among Germany’s 82 million inhabitants.5 They are still a tiny minority, but the population has grown significantly—all but approximately 30,000 migrated after the Syrian uprisings began in 2011. The German government has developed a series of systems to integrate its new refugee population, and a momentous effort is underway by all parties involved: federal, state, city, and local governments, civil society, and of course the refugees themselves. Germany’s world-renowned vocational school system in particular is working to integrate refugees into the country’s workforce, a necessity due to a nationwide labor shortage. But there are also those working to reverse Merkel’s welcoming policies on immigration, and the backlash she has faced was clearly evidenced by her difficulty forming a coalition after the last election, and the rise of the far-right, anti-immigration party, Alternative for Germany (AfD). Interior minister Horst Seehofer foisted a major challenge on Merkel in advance of an EU summit on migration in late June, but she managed to pull through, reaching a deal with neighboring countries to tighten security along the border with Austria and build border camps for asylum seekers previously registered in other EU countries. On top of the bureaucratic and logistical obstacles, the challenges of societal integration facing the Syrian community are clear. For many Germans, integration means assimilation, while many Syrians are hoping to maintain their strong traditions from home. As in other European countries, the Muslim veil for women is a flashpoint, with Germans and Syrians alike conceding that women who refuse to stop wearing the veil are often seen by Germans as unwilling to embrace their new home, and will be considerably limited in their employment opportunities. Indeed, a recent report by the state-funded Institute for Employment Research (IAB) said that refugee unemployment had fallen ten percentage points over the past year, and at this rate half of the refugee population that arrived in 2015 would be working by 2020. Refugee unemployment now hovers at 40.5 percent (overall German unemployment is at around 5 percent). So the refugee unemployment rate three years after arrival is 40%? That’s phenomenally bad. If that’s success, boy, I’d hate to see what failure looks like. So, short answer: Refugees created a public backlash. There are serious points of tension over clothing. And refugees’ unemployment rate is 40% three years after arrival in an economy with a labor shortage. And you think this should be the model for the US?